ESPN and Top Rank Boxing presented a Friday evening card live from Minnesota’s Grand Casino. 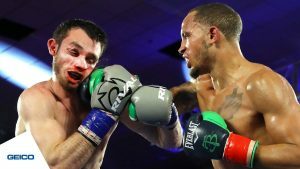 The main event featured WBA “Regular” Middleweight champ Rob Brant, 24-1, making his first title defense against 17-0 Ukranian Khasan Baysangurov. First off, however, Chicago’s 19-1-1 bantamweight Joshua Greer Jr battled the 19-3 Giovanni Escaner of the Philippians. The scheduled10 round contest was for a stepping-stone belt, the World Boxing Council Continental Americas Bantamweight Title. Escabar started well. Greer picked up steam in the middle rounds, however. Although Escabar was able to drop his man at (or after) the bell ending the 3’d, Greer put is man down – and out – at the end of the eighth with a perfect body blow. It was a story of one fighter riding out some tough moments and working steadily until he found a moment of his own. Next up, the 9-0 2016 American Olympian Mikaela Mayer faced the 13-1-1 Yareli Larios of Mexico in a scheduled 8 rounder for the NABF Female Super Featherweight Title. Meyer, the champion, employed sound footwork, but the aggressive Larios was able to apply pressure effectively, employ effective aggression and find her mark early on. By the mid rounds, Mayer was better able to assert herself, though Larios was still arguably the more active fighter. As the fight went into the later rounds, Mayer’s skill set was starting to tell the tale over Lario’s fighting spirit. By the end of the 7th Larios was taking such a beating that the bout could have been stopped. Meyer ended up dominating the 8th and final round, leading to a UD win. It was time for the main event. Brant moved in for the kill right at the opening bell. The local fighter went on to completely dominate the round. A Brant right dropped Baysangurov in the second. The Ukranian, however, beat the count. Baysangurov was certainly game, but his lack of head movement clearly made him an easier target than he should have been. WIth that being said, the third was a much better round for the challenger than the first two had been. The fourth was fairly close, but Brant’s activity gave him the edge. By the fifth it was clear that it was to be a high octane affair essentially throughout. The midpoint of the fight showed that although Barsangurov had his moments, Brant was having the better night, dominating the tempo with greater frequency and landing more effectively than his foe. Brant continued to land and move well as the fight progressed into the later rounds. Heading into the championship rounds, it looked as if Brant simply had to do what he had been doing up until that point in the fight – be active and dictate the tempo. After a brutal attack in the 11th, the bloody Baysangurov hit the mat again. He got up bravely, but Brant moved right in again and the referee wisely stopped the fight.